This retelling of an 18th-century tale attributed to Rabbi Levi Yitzhak of Berdichev explores the cruel and uncontrollable nature of gossip. The book opens with a poem. Appearing before a wise rabbi, a woman who has damaged the reputation of another insincerely vows to make amends: 'I will take back my words….' The rabbi, fearing that she has not learned her lesson, instructs her to gather all the feathers released into the wind from a feather pillow. Forest's retelling is simple and elegant, using some dialogue and spare descriptions. Cutchín's bright watercolor illustrations fill in the Eastern European setting well, using varying and fresh perspectives. 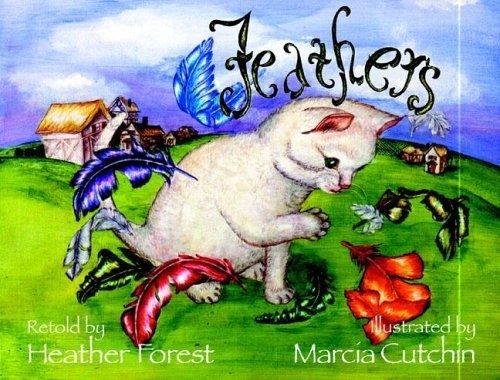 Brightly colored feathers play prominently across the pages. The artist's style is rich in detail, but her people appear somewhat wooden. Still, this is an entertaining tale, ably retold, with a timeless lesson.